Rebecca Hosking is a Nashville Singer, Songwriter, and Guitarist who blends a traditional country vibe with Americana Folk roots and soothing vocals to create a sound quite uniquely her own. 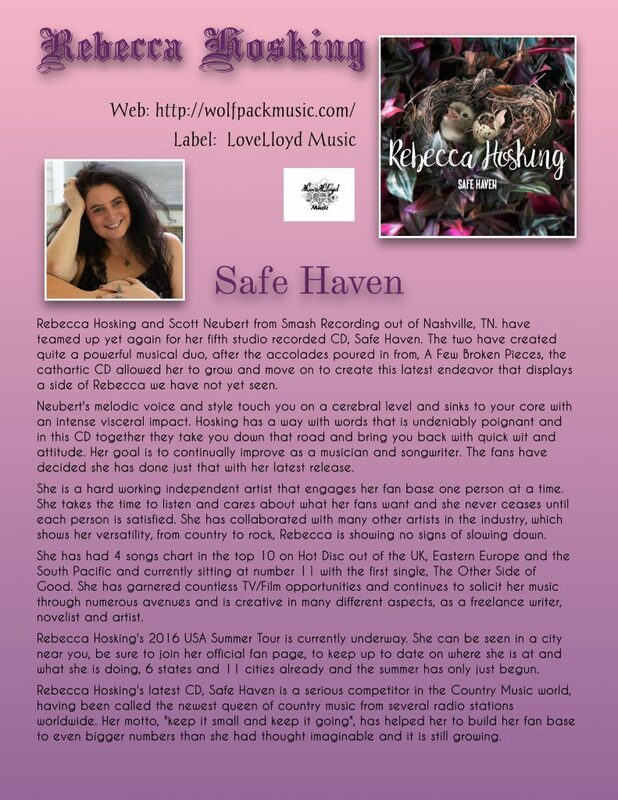 Rebecca has been perfecting her vocals most of her life and displays her unique style with her latest album releases, “A Few Broken Pieces” and “Safe Haven“. Have a listen to her playlist below. Great music! Enjoyed very much. well, what can I say, you are the Boss!!! jejeje! One of the best natural country singers, I have heard in many years. Great song writer, Give her a listen and you will be a fan. thank you so much James! Loved her music from the first day i heard Flattered. My first and only fan for a very long time. So very grateful for everything you do for me! Lovin you!!! Rebecca has a great captivating voice…. Once heard you are hooked….. A great songwriter as well.. Thank you so much, you are such an amazing friend and supporter!!! Lucky is ME! I could listen to the music of Rebecca Hosking all day! Great composer & vocalist. You are pretty amazing yourself Helen!!! thank you Pamela for stopping by and leaving such a kind comment! Rebecca’s music has made me happy all year long particularly as I did the paperwork side of my job. It kept my spirits bright as it led my soul along a journey…. Yes, I too listen to Rebecca and the rest of The Pack Artists all day, every day while at work. I find that their music really helps me through the day! Rebecca’s music has accompanied me all year and kept my soul happy & uplifted. Anything I’m feeling finds it’s reflection in one or other of Rebecca’s powerful and deeply feeling songs. Rebecca’s latest album has outshone the others. She has surpassed herself with her writing ? Powerful Sincere words and music from the heart and mind of one of todays truely amazing Singer/Songwriters. A must have album for anyones collection. One year on & I still listen to the music of Rebecca Hosking every day! Just when you think she can’t top ‘this’…. She DOES! I agree Helen…she’s got “the gift” and what I love most, is that she keeps churning out top notch music consistently to tickle our ears! awww… love you guys!!! smiling so big! Wolfie, you are the bestest bestie a girl could ever ask for!!!! aaaarrrooooooooo! I enjoyed the interview you had with Rebecca on Ready For Love radio yesterday. Thank you Nikki!